Tuesday, March 2nd, dawned bright if not sunny and after sleeping quite well I awoke refreshed and ready to take on the day. The first order of business was breakfast (included with my room) at the farm house where the chef was celebrating Dr. Suess' birthday with "green eggs and ham" - poached eggs on top of an English muffin with Candian bacon and a Vermont cheddar cheese sauce that was tinged sorta-kinda green. Trust me, it was delicious even though the color may not be all that appealing! Breakfast was served by Mandy, a personable young lady, who had been working the front desk the evening before when I checked in. Out of all the staff members I met, I'd have to say that Mandy was my favorite as she was very helpful, very nice, and very personable - a true delight. She asked me what I had planned for the day and I told her that I was heading towards Stowe in search of covered bridges to take pictures of; in particular I was looking for Emily's Bridge - Vermont's reportedly haunted bridge. She said she'd heard of it but never been to see it and thought I was brave for going - especially by myself. I told her I'd be sure to let her know if I came across anything unusual! Having breakfast at the same time as myself was a family of three from Quebec who had come down to do some snowshoeing. It's easy to forget that Quebec is as close as it is to where I was in Vermont but they apparently traveled a shorter distance than I did to get there! As their son tucked into his snowman pancakes complete with powdered sugar snow, the mom mentioned that she'd always wanted to go to Connecticut as Martha Stewart "made it look so nice." I kind of had to laugh to myself on that one as the part of Connecticut that Martha Stewart lives in is more like New York but I thought they'd probably enjoy either the northwest hills or the Woodstock area. I guess it's easy for me to forget that there really are some very pretty areas of Connecticut - you just have to take the time to look for them! 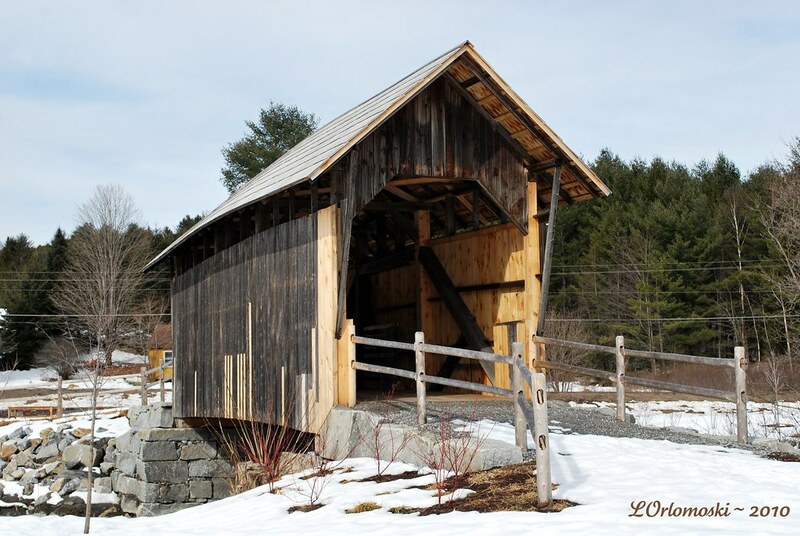 As soon as breakfast was over I grabbed my list of covered bridges, a couple maps, a handful of brochures, my iPod, and my GPS and headed west on Route 2 towards Stowe. The day was a little overcast but it looked like it was going to clear up so I was hopeful of decent weather for some pictures. As I drove I saw a lot of things I would loved to have taken pictures of but one of the things I learned about Vermont roads - in addition to there being a lot of dirt ones - is that they don't have much for a shoulder so there was really no place to pull over. It was at that point that I wished I had my own Ralph to chauffeur me around like Princess Patti does so that I could take some "passenger side pictures". Alas, no such luck! As I was driving down Route 2, I came into a small town called Marshfield where on the right-hand side of the road - in what looked to be the middle of a field - I spotted a covered bridge. Ah-ha! First catch of the day! The Martin Bridge is a 44-foot long queenpost style bridge that was built in 1890 for William Martin, Jr. and his first son, Harry. 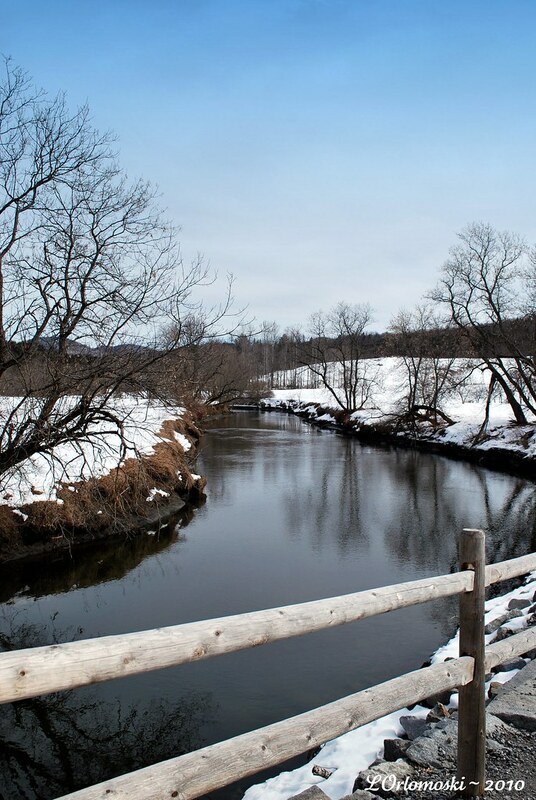 The Martins owned the farm adjacent to the bridge, which was reported to be one of the finest in Marshfield, and the bridge was built in order to give them access to their fields that lay on the other side of the Winooski River. Bridges built for farming purposes were narrower with fewer supports than a typical covered bridge and they were also taller to accommodate horse-drawn wagons that were piled with hay. Another unique aspect was a cattle gate that was attached to one of the queenposts that could be closed to keep livestock on one side of the bridge or the other. 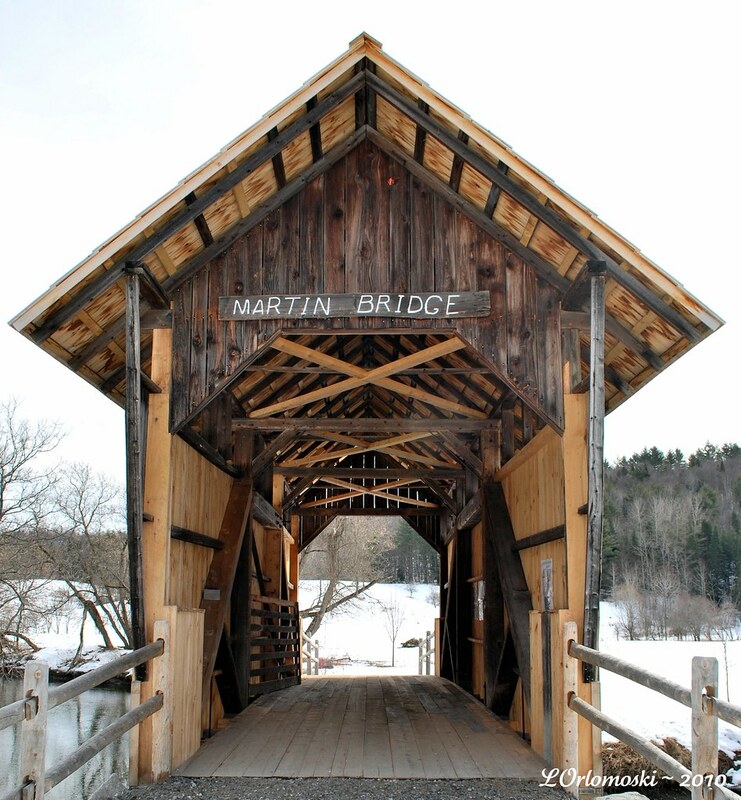 The Martin Bridge is believed to be the only covered bridge in Vermont that never had an actual road cross through it as it was built strictly for agricultural purposes. Apparently bridges of this sort were rather uncommon as most farmers couldn't afford to build covered bridges that were simply for farming access but obviously the Martins could and they did. 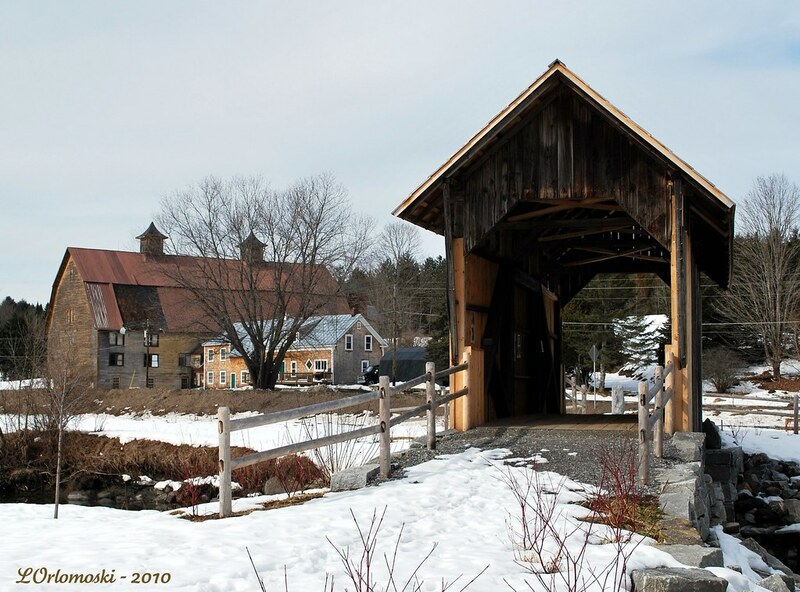 The Martin Bridge is the only covered "farm" bridge left in the State of Vermont and it's made even more special by the fact that it is one of the few local covered bridges that survived the Flood of 1927 that wiped out over 1,200 covered bridges throughout Vermont. 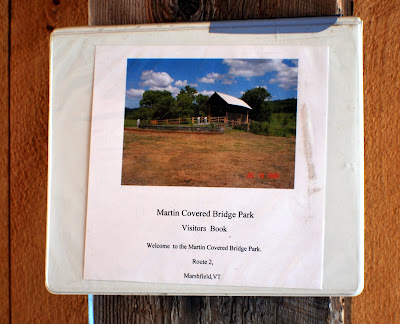 In 1924, the Martins sold their farm and its bridge to the Orton family who owned and maintained it into the 1970's; at which time it became known as the Orton Bridge - as it was listed on my print-out of covered bridges. 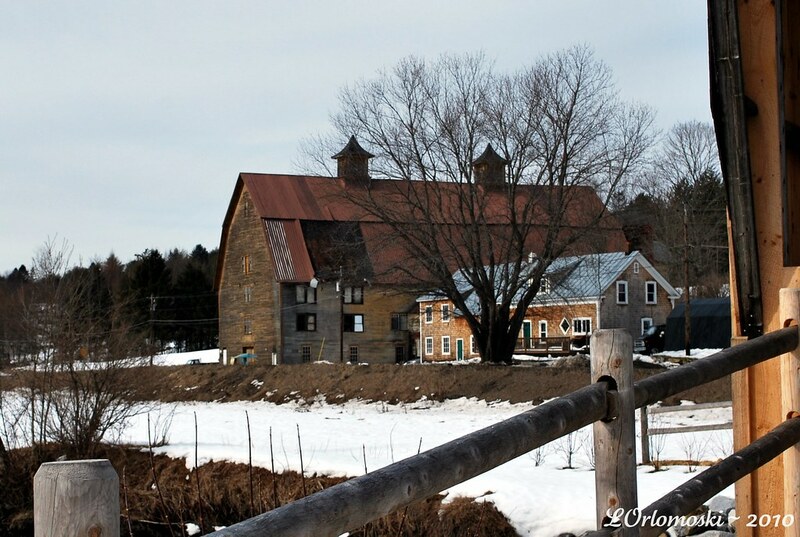 In the 1970's ownership changed yet again and then in 2003 a landowner donated it to the town of Marshfield along with the surrounding 72 acres on either side of it in lieu of about $1,300 in taxes. When the town took over ownership of the bridge it was tilting about 18 inches to one side and could have fallen into the river so town officials decided to refurbish it and started the process by hiring a crane operator to lift it from its supports and move it to a nearby field where it stood for nearly five years while awaiting repairs. In March of 2009, Building Heritage - a Vermont-based company that "combines the finest craftsmanship in traditional trades with advanced knowledge of historic preservation, ethics, and rules" - began the restoration of the Martin Bridge by labeling and documenting as much of the bridge as possible. After that it was carefully disassembled so that rotten timbers, sheathing, roofing, and decking could be replaced or repaired. Before the end of April, the bridge was fully reassembled and, with a crowd of onlookers nearby, the bridge was placed back over the Winooski River on rebuilt granite abutments with the help of a 165 ton crane. 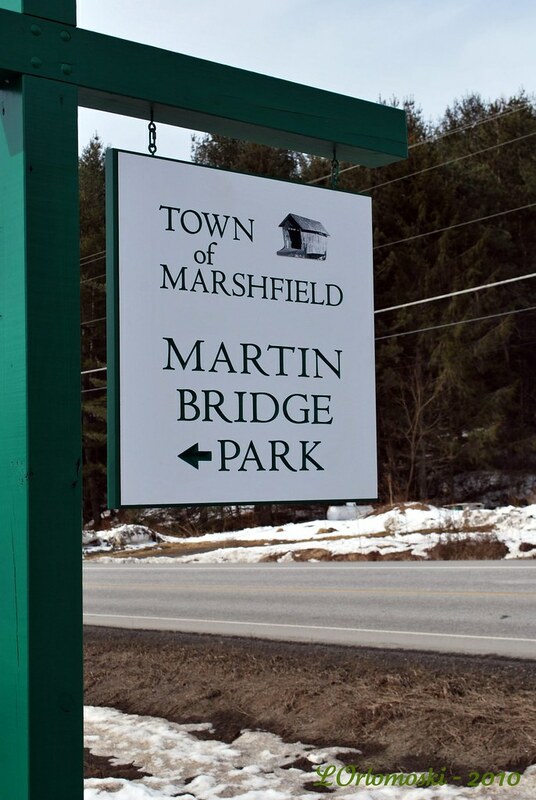 In addition to restoring the Martin Bridge, the town of Marshfield made use of the 72 acres that was given to them by developing a park appropriately called Martin Bridge Park that includes a parking area, a pathway to the bridge, signs, a stone sitting wall, and walking trails that connect to an old railroad bed that is now used by hikers and bikers. The project was paid for by $241,000 in grants from the Vermont Agency of Transportation enhancement program, $40,000 from the Housing and Conservation Board, and $25,000 raised locally. In my opinion, money well spent! Now that I've given you probably more information on the Martin Bridge than you ever wanted to know, I have to tell you about something that happened while I was there that got me humming the tune "It's a Small World". Inside the bridge, the town has placed a guest book for visitors to sign with their name, address, and any comments they'd like to leave so I figured sure, I'll sign it! After affixing my name in the open space, I looked at some of the other names above me and what did I see three spots up from my name? The name of one of the EMTs that I work with at American Ambulance who had been there just about two weeks before myself! I really had to smile as I thought about the fact that there I was, just about smack in the middle of Vermont in a small town that I'd never heard of until that day, and someone I worked with had been there just a short time before me. It really is a small world after all! 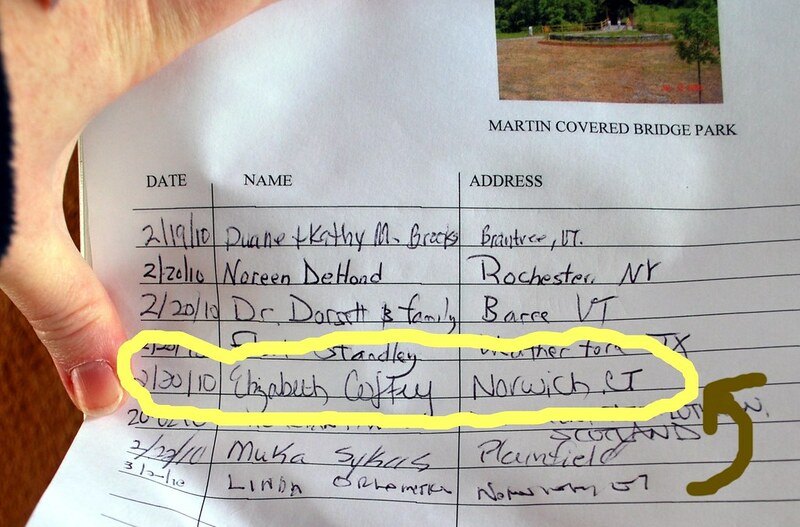 So just remember - if you're ever winding your way through the of Vermont on Route 2 and find yourself in the small town of Marshfield, be sure to stop in at the Martin Bridge Park near the Winooski River and sign the visitor's book inside the covered bridge - you never know whose name you might find above yours! What a lovely little bridge and park. As always, such a great little history lesson! The green egss? I don't think I could've eaten them. Just saying. so what's the point of covering a covered bridge? I mean, the road isn't covered so foul weather protection isn't it. I've never seen a covered bridge before, now I kind of want to go up there to see them for myself. And I can stomach a lot of things, but I do not want those green eggs and ham, Sam I am. Now you have me craving eggs benedict! LOL! Me, too, Lois! I'll pass on the green color, though. Great post and photos, as always. How fun and it really is a small world. That's quite the find. What a great history of this bridge too. You really do dig into your travels. The green breakfast was probably very good, but I'm not sure I would have cared for the green sauce. Just saying. A fine bridge, Linda. So picturesque. Those are amazing photographs. You need to turn them into a framed tryptich and get them on a gallery wall. Oh Linda, sorry I didn't see this on Thursday. Yep, I do take a ton of photos from the passenger window don't I? I love the fact that a co-worker had recently been at the same spot as you were. 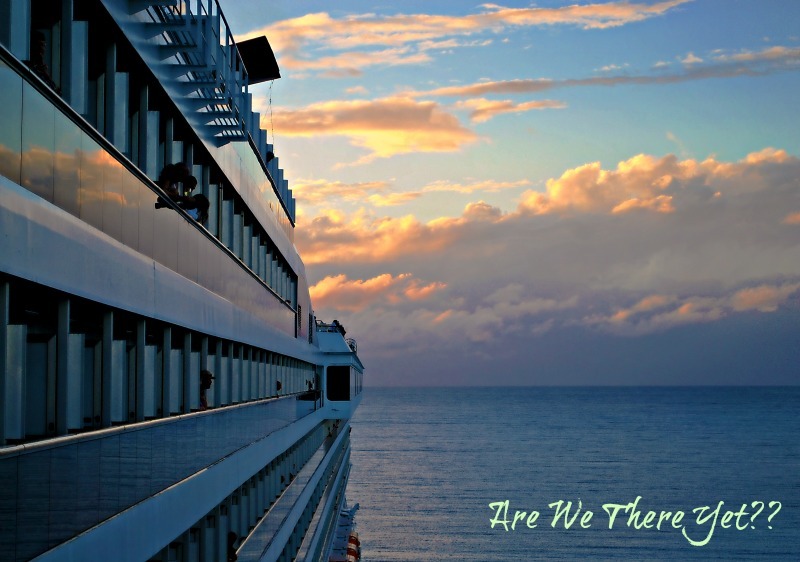 You should do some freelance travel writing! You are so good at describing the interesting locales you find on your adventures.